On Super Bowl Sunday, there was a shooting in the 3300 block of Adeline Street in West Oakland. What made it stand out from the background of shootings in the city was the toll: seven reported wounded. So that afternoon, I put together a map and list of the reported shootings over the past week. That spate of violence was enough for Oakland Police Chief Howard Jordan to call a press conference, promise to redouble the department’s efforts to fight crime, and to appeal to the public to report shootings and illegal guns to police. There’s little evidence that the pace of the shootings has slackened since then. The toll for the past month, going back to January 29, is 14 dead and 29 wounded (one of the killings was a stabbing; one of those wounded was a man shot by police after a reported robbery). But that toll minimizes the frequency of firearms incidents in the city. From Feb. 1 through today, the Oakland police report 45 incidents of “assault with a firearms on a person,” 41 incidents of shooting at dwellings or vehicles (either inhabited or uninhabited), 94 robberies involving firearms, seven cases of willfully discharging a firearm in a negligent manner, 14 cases of exhibiting firearms during the commission of another crime, two cases of carjacking with a gun (there are a few incidents in the OPD database listed under more than one of these categories). An updated map is below. Each placemarker includes the available details on the incidents reported (I’ve limited the maps to homicides, reported shootings of people, and other incidents in which guns were apparently fired). One pattern in the map: It’s striking to see how few shootings occur above (east or north of) Interstate 580. If there’s a geographic boundary to shootings that seems to hold for most of the city, that’s it. The Ziolkowski monument to Crazy Horse in South Dakota’s Black Hills. Last June, I drove from Seattle to Omaha with my son Eamon and my daughter-in-law Sakura. Our first day took us into western Montana. The second day saw us get to western South Dakota after a stop at the Little Big Horn. And the third day we started out with a quick blast through the Black Hills. We stopped in Deadwood, then headed to the Crazy Horse monument. That’s the picture above. If you pay a little extra when you visit the memorial, you can take a bus ride right up close to where the work on the monument is going on. 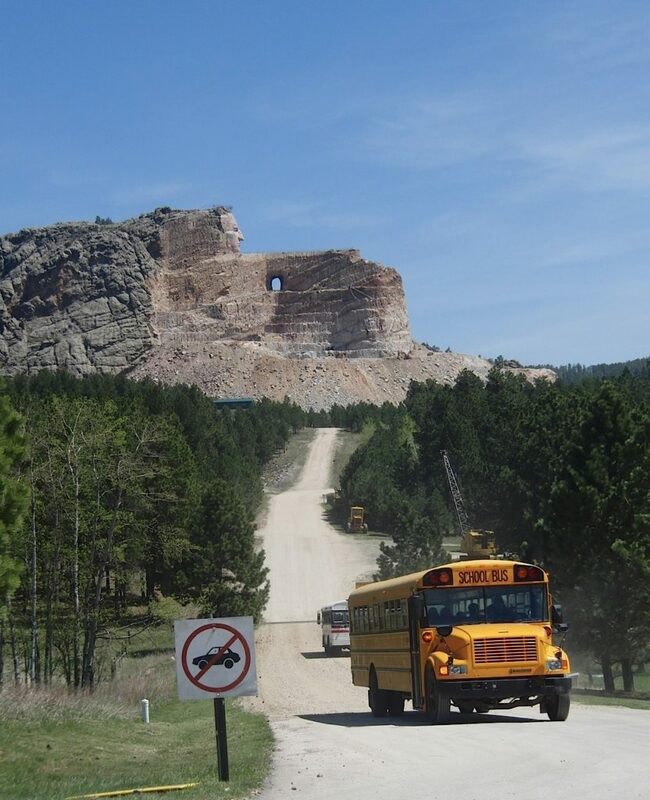 I had been to Crazy Horse once before, back in 1988, with my dad, when we were on our way to the Little Big Horn. Back then, you had to take the artists’ word that something would emerge from the mountain they were blasting away. At the visitors center, we paid a dollar for a chunk of granite from the rubble, faced with mica and shot through with what look like nodules of pyrite. The rock’s here on the dining room table as I write this. Twenty-three years later, something dramatic has been brought out of the mountain, and the scene around the area has changed, too. The site is now approached on a route that’s turned into a major highway, and the turnoff is controlled by the kind of traffic signal you see on expressways in San Jose. There’s an entrance plaza with maybe six lanes, just like going into a stadium parking lot. After that, there’s plenty of parking, a museum, shops, and beyond that, the mountain. Lots of people were visiting the early June day we stopped, though I wouldn’t say the place was overrun. “In the Black Hills, near the town of Custer, South Dakota, sculptors are carving a statue of Crazy Horse from a six-hundred-foot-high mountain of granite. The rock, called Thunderhead Mountain, is near Mt. Rushmore. The man who began the statue was a Boston-born sculptor named Korczak Ziolkowski, and he became inspired to the work after receiving a letter from Henry Standing Bear, a Sioux chief, in 1939. 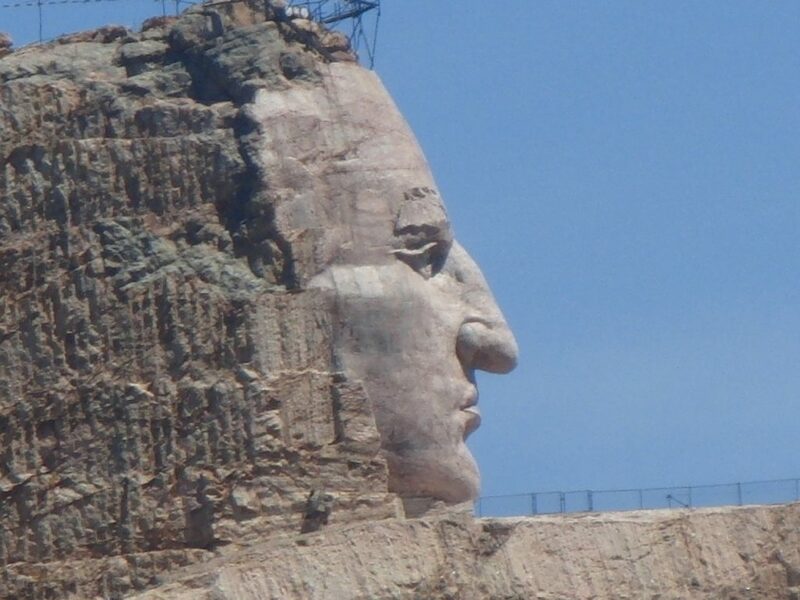 Standing Bear asked Ziolkowski if he would be interested in carving a memorial to Crazy Horse as a way of honoring heroes of the Indian people. The idea so appealed to Ziolkowski that he decided to make the largest statue in the world: Crazy Horse, on horseback, with his left arm outstretched and pointing. From Crazy Horse’s shoulder to the tip of his index finger would be 263 feet. A forty-four-foot stone feather would rise above his head. Ziolkowski worked on the statue from 1947 until his death in 1982. As the project progressed, he added an Indian museum and a university and medical school for Indians to his plans for the grounds around the statue. Since his death, his wife and children have carried on the work. If you happen to go to the monument in the fall, there’s a walk to Korczak Ziokowski’s tomb every year on October 20, the anniversary of his death. Also interred there: his daughter Anne, who died last year just a few week’s before we visited. Her obituary, brief as it is, speaks volumes about the family’s commitment to the Black Hills. Black Hills Crazy Horse monument in closeup. When you tell Bay Area acquaintances that you live in Berkeley, usually they’ll ask, “Where?” I sometimes feel it’s a way of trying to get an idea of where you’re standing on the socioeconomic ladder. If you say “the Hills,” that conjures pictures of secluded streets, sweeping views, and steep home prices. If you say “West Berkeley” or “South Berkeley,” that may convey a picture of a flatlands neighborhood that’s less white than the rest of the city, maybe more affected by street crime, maybe a place you can find what passes in these parts for affordable housing. “Elmwood” to me says genteel, tree-lined streets studded with big, beautiful old houses. Our area is North Berkeley, a comfortable part of the city, if not a rich one. An area known for its proximity to the Gourmet Ghetto, a good-food neighborhood that’s actually been institutionalized. We’ve got one of the best produce markets in the country here, and every block sports at least one Prius or electric car at the curb. We’ve got decent schools and parks nearby. We’re close to public transportation, and this is one of the places where the unique and wonderful casual carpool started. But those generalities don’t do much to show you the particulars of life in the neighborhood. You don’t pick up on the block parties, the parents cajoling kids to get into, or out of, the car, the neighborhood feuds, the badly parked cars, the influx and outflow of commuters every day, the hired gardeners and dog walkers, the clipboard-toting solicitors for political and social causes, the dogs barking at the postal carriers, the local dogs and cats and their tendencies, the FedEx and the UPS drivers, the new neighbors up the block, the discarded TVs or settees on the curb with signs that say “free,” or the lost cat posters and announcements for yoga classes on the telephone poles. You also don’t encounter the occasional house that seems, apart from neighboring structures, to be sinking into ruin. Maybe we notice that more now that The Dog has us on regular rounds on nearby streets, but there’s one block in particular that stands out for having a couple of spectacular wrecks. One of the buildings appears to be a duplex–there are side-by-side entrances. A couple of the window panes have been replaced by plywood. There’s no sign of anyone going in and out, and the curtains appear to be permanently drawn. Right next door is a sprawling two-story house that also looks like it’s in a losing battle with weather and gravity. There’s a collection of junk and old boxes on the porch and a big liquidambar tree in the front yard; right now, weedy spring growth is emerging from an autumnal carpet of dead leaves. I’ve seen someone at this place–a woman who on occasion suns herself on a green plastic chair in a clear patch of driveway. She barked at me once two or three years ago for walking the dog off-leash. Occasionally, there’s a battered early-’70s Chevy Impala parked on the curb. Evidently it’s a live-in vehicle, and you’lI see it cruising the area (top speed about 20 mph). The overall effect: a sort of Berkeley-ized version of Miss Havisham’s place in “Great Expectations.” You wonder whether there’s someone just barely hanging on to these places. Not all is ruin, though. Outside that first house, a couple of shrubs are flowering right now (the pictures up above). The one on the left is a kind of magnola. The one on the right I’m not sure about. Below is the second house mentioned above. Wednesday evening, Milvia Street and Yolo Aveneu, as the sun set on an unbelievable February day: clear, temperature in the low 70s, the streets abloom (yes, after seeing winter afternoons like this for 35 years, I think they’re unbelievable–I guess I still have that much Chicago in me). Creeping into the quiet spaces of that reverie, the thought that the weather is eating away at the little bit of a snowpack that’s built up in the mountains. From here, the year ahead looks very dry. 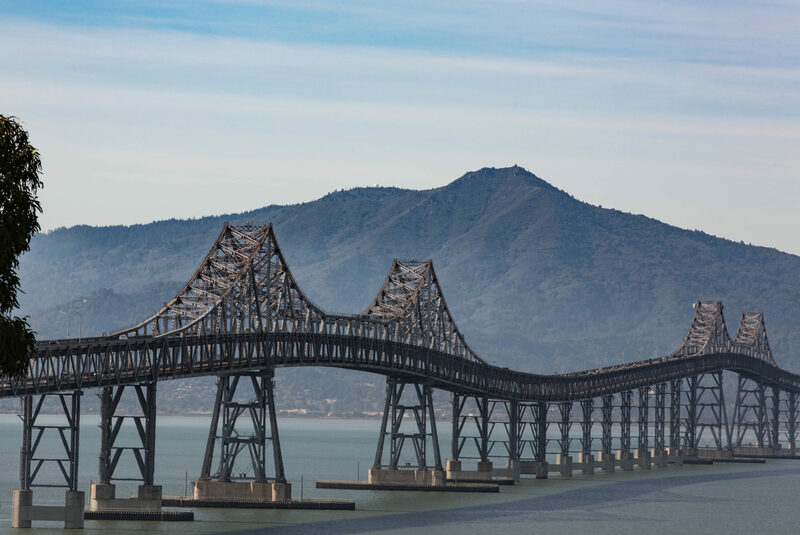 If the world of intermodal transportation entrances you–and few among us can resist the charms of cargo containers on ship, rail, and truck–then the area around the port of Oakland is for you. Upon disembarking from the ferry at Jack London Square on Friday night, we encountered a freight train stopped at the corner of Second and Clay streets. The crossing gates were down, but the train was at a dead stop, so it was safe to cross. Picture-taking ensued. After five minutes or so, the locomotive horn sounded, and the freight began to roll. Amazing to contemplate the power and energy required to get so much weight moving in such short order. One minor drama: As the train rolled across the intersection, a pedestrian decided to run across the street in front of it (see if you can spot that moment in the slide show below). It wasn’t really a close call, but you kind of wonder what (beyond pure ignorance of the consequences of stumbling and falling) would prompt somebody to try that. Probably a feature of every big-city transit system: the itinerant musician who shows up to play at the stops along the way. The North Berkeley BART station a couple blocks from where we has a cast of folks who show up semi-regularly. There are three guitar players I can think of whom I’ve seen out there: a middle-aged guy who plays a nice classical guitar and always seems to land a decent pile of bills from the from passersby; a young guy who has sung himself hoarse thrashing out folk-rock tunes and looks ragged, like he’s barely hanging on; and the woman above. A mural from last fall, when all the world was Occupied. On 16th Street and Harrison, in what I describe as the seam between the Mission and Potrero Hill. The building houses a book bindery (to the left) and a club (to the right) that just reopened as a joint called Dear Mom. And who was Nicholas Klein? As near I can tell, a liberal (or further left) lawyer who hailed from Cincinnati. Besides the quote above, delivered to a labor convention, he turns up a couple other times in 1918 in letters to the editor of The New York Times, decrying German aggression against revolutionary Russia. I find Klein making a brief re-appearance in 1930 as a friend and benefactor of James Eads How, a well-to-do St. Louis man who was an advocate for homeless migrant workers (a.k.a. hobos). But that’s another story. It’s raining tonight here in Berkeley. It rained a liittle here on Friday, too, and some more a few days before that. Except for the fact the rain has only added up to a large thimbleful so far, it’s almost like a real winter has snuck in to Northern California. A couple more little storms might shuffle through this week, but the forecasters seem to be competing with each other to display the most pronounced lack of enthusiasm about the prospects for any appreciable rain falling. One can understand why they’re a little out of sorts. February is a time when storms have made history in California, when meteorology is a matter of life and death. This year, the weather scientists here are keeping their eyes peeled for computer models that might portend a tenth of an inch of rain. The Bay Area winter is notable for its lack of snow drifts and subzero (Fahrenheit) temperatures; though, from what I hear, that’s true of virtually the entire country this this winter. But here’s something that doesn’t happen everywhere: in late January and early February, buds begin to flower. I’ve taken a picture of this particular bush before; it’s a flowering quince just up the street from us. Elsewhere in the neighborhood, plums trees are big, showy piles of pink. It’s almost enough to make you forget this year’s non-winter. Twenty-eight people shot, and seven of them killed, since last Sunday. That’s the toll in Oakland, as far as I can glean from news reports (detailed below; those numbers exclude about 45 other episodes, mostly robberies, in which guns were used in Oakland). Maybe it’s just me, but that seems like a lot, though the Oakland Police Department’s latest weekly crime report, with preliminary numbers through last Sunday, actually suggests an overall drop in violent crimes so far this year compared to the year-ago period and the three-year running average. Anyway, the thing that made me do this was the report of seven people shot on a West Oakland street earlier today. News reports of the past week are listed below, and below them is a quick Google Map I put together. Sunday, Feb. 5: Seven shot Sunday afternoon in West Oakland and North Oakland: Victims said to be in stable condition after a possible shoot out between two groups in 3300 block of Adeline Street. Friday, Feb. 3: Murder report: Oakland Police Department tabular data (the department’s running summary of serious crimes in the city) includes a report of a murder in the 9800 block of C Street (East Oakland) at 12:20 p.m. I haven’t found a media account of this case. Thursday, Feb. 2: Murder report: Oakland Police Department tabular data (the department’s running summary of serious crimes in the city) includes a report of a murder in the 400 block of 19th Street (downtown, close to the 19th Street BART station) at 7:42 p.m. I have found no media account of this case.